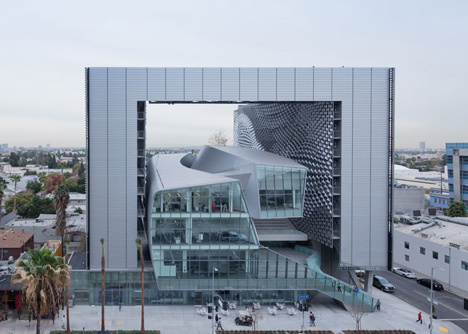 Thom Mayne's Los Angeles firm Morphosis has completed a new Hollywood campus for arts school Emerson College where a rectangular frame surrounds a curvaceous cluster of classrooms (+ slideshow). 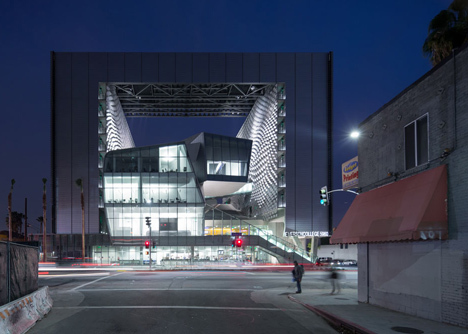 Situated in the heart of the entertainment industry on Sunset Boulevard, Emerson College Los Angeles will accommodate over 200 undergraduate students from the renowned creative arts and communication school based in Boston, Massachusetts. 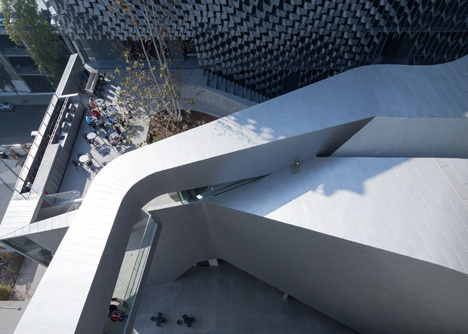 The building's frame-like outer volume accommodates ten storeys of student housing, while the curving central sections contain teaching facilities and staff administration, amidst a series of terraces and connecting bridges. 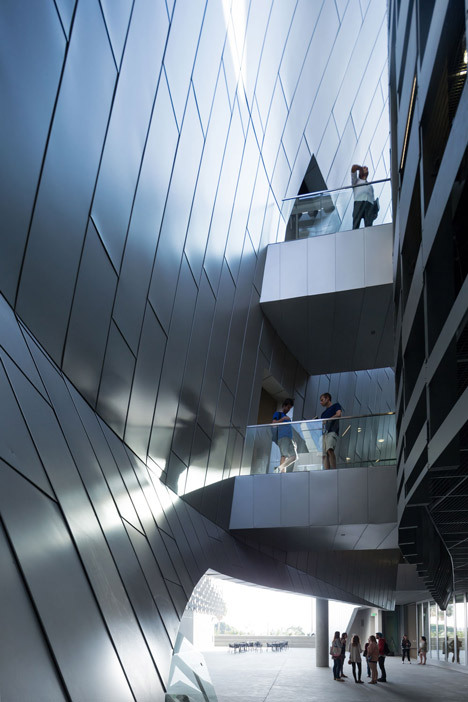 "The building is designed to expand the interactive, social aspect of education," said Thom Mayne. "We focused on creating with the broader community in mind - both in terms of public space and sustainable design." 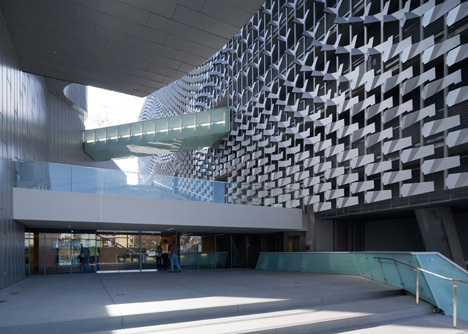 The east and west-facing sides of the building feature glazed curtain walls and are screened by an intelligent shading system where horizontal fins angle open or closed to suit changes in light, temperature and the angle of the sun. 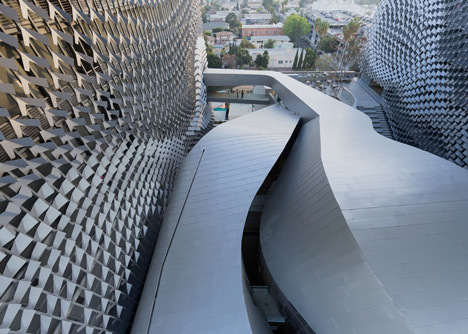 Rigging and audio-visual equipment are also incorporated into the facade's metal framework, accommodating various outdoor performances and events. 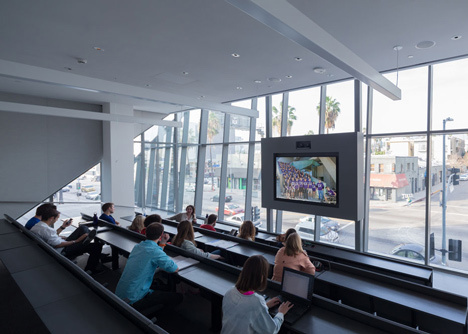 "The entire building becomes a stage set for student films, screenings and industry events, with the Hollywood sign, the city of Los Angeles and the Pacific Ocean in the distance providing added scenery," said the design team. 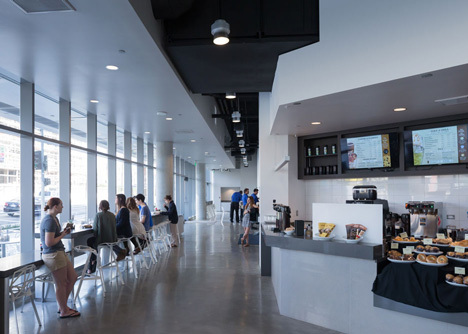 Teaching areas and workspaces within the facility include video-editing suites, computer laboratories, a film screening room, sound mixing suites, and live performance spaces. There's also a green wall at the north-west corner.